Crystal Properties: Pink Fire Azeztulite is colored by streaks of dark, brownish-red hematite. It is an Azozeo super-activated type of Agnitite. 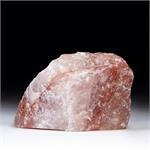 Crystal Healing: Pink Fire Azeztulite is a stone of passion. It encourages one to love with great intensity, with no holding back. It triggers the potential to truly know that love is our foundation, our Life Force and the animating energy of the Universe. Pink Fire Azeztulite can teach the cells that love is the antidote to illness and even death. Thus it is ideal for those seeking to heal dysfunctions such as autoimmune disorders. It is useful for emotional self-healing as well, bringing an infusion of unconditional love into one’s energy field, dissolving the lingering echoes of old wounds. All the Pink Fire Azeztulite™ shown here has been Azozeo™ Super-Activated!